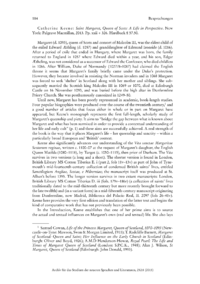 Margaret (d. 1093), queen of Scots and consort of Malcolm III, was the eldest child of the exiled Edward Æthling (d. 1057) and granddaughter of Edmund Ironside (d. 1016). After a period of exile that ended in Hungary, where Margaret was born, the family returned to England in 1057 where Edward died within a year, and his son, Edgar Ætheling, was not considered as a successor of Edward the Confessor, who died childless in 1066. After William, Duke of Normandy (1027/81087) had claimed the English throne it seems that Margarets family briefly came under the Dukes protection. However, they became involved in resisting the Norman invaders and in 1068 Margaret was forced to seek shelter in Scotland along with her mother and siblings. She subsequently married the Scottish king Malcolm III in 1069 or 1070, died at Edinburgh Castle on 16 November 1093, and was buried before the high altar in Dunfermline Priory Church. She was posthumously canonized in 124950.